When considering the purchase of replacement windows the following features will assist you in understanding what a window should be comprised of. Replacement windows are a major home investment and you should buy quality features that will guarantee you a product that will not only continue to look good but will perform for a lifetime. Window Frame – The combination of joining a horizontal head and sill extrusion with vertical jambs to provide an opening for moveable or secured sash. Methods of joining the frames include mechanical (screwed) or fusion welding of the extrusions. The mechanical method allows for easier repair and better operation. Dual Window Frame – When two or more materials, such as vinyl and aluminum are in concert together to provide the best in beauty and strength. The aluminum should be thermally broken or poured and debridged. This method deters the transfer of heat or cold to the opposite side. 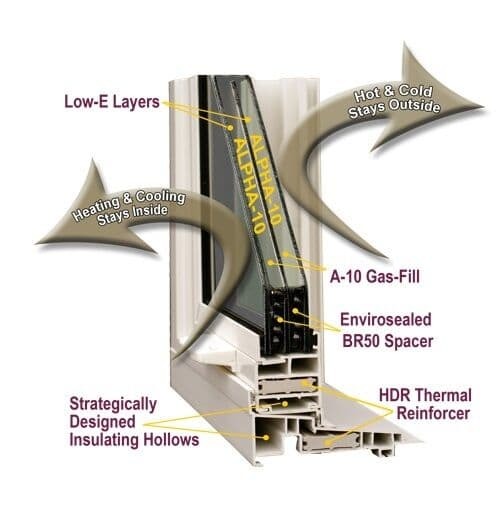 Combining vinyl and aluminum as the frame and sub frame creates a window that can house triple insulating glass without restrictions or hazards in operation. It also provides a superior anchoring material that virtually eliminates the joining and hardware screws from stripping out. Sash Frame – Sometimes referred to as glass housing or insert, consists of horizontal and vertical extrusions. Fusion welded sash frames create strength while adding a more aesthetically appealing look due to its continuous style. Dual Sash Frame – An additional material is inserted into the horizontal sash members for the purpose of stability and screw retention of hardware and locks. A revolutionary polystearate material increases the thermal properties of the location where the top and bottom sash meet or interlock, while providing the strength and durability that aluminum has. Extrusions – Lengths of vinyl and aluminum that are formed using architectural dies that have been precisely engineered to assure specified tolerances and thicknesses. Head – Refers to the upper horizontal boundary of the window and represents the top of the entire window. Sill – The bottom horizontal member forming the frame of a window. The sill steps out from the building and should be stepped or sloped to provide the means for water and debris run off. Jamb – The left and right vertical members forming the sides of a window frame. Sash – Horizontal and vertical extrusions assembled together for the purpose of holding the glass and allowing for opening and closing, as well as providing a view to the outside. The sashes are housed inside the window frame. Insulated Float Glass – Glass is processed via a method of floating on molten metal while the top surface is formed with gravity. This produces the finest optical quality in glass and is superior to conventional plate glass. The formation of two or more pieces hermetically sealed creates insulating glass. The larger the depth of multiple pieces of sealed glass is indicative to its thermal properties. Three pieces of glass creates two equal, 1” overall, air spaces and a center barrier. Low-E – The addition of a reflective low emissivity layers of microscopically thin optically transparent layers can be applied in two ways; hard coat or soft coat. The later of the two has longer lasting and better thermal properties. Low-E non-metallic coatings can also be applied in different levels of thickness. Multiple coatings Low-E creates an optimum barrier from harmful ultraviolet rays and creating temperature controls. As the method indicates it reflects hot and cold back to its source. Continuous Thermal Spacer – Material used to bond two or more pieces of glass together to prevent air and gas leakage and provide a low conductance seal. Spacer material that references “warm-edge” technology is far superior to the conventional method of using high conductance aluminum spacer bars. The fourth corner is hermetically sealed after insertion of gas filling. Gas Filling – Inert gas is used to fill the cavity created by joining two or more pieces of glass together. Gas being denser than air provides a better barrier to unwanted temperatures and sounds. Proprietary gas combinations are far superior and affordable in comparison to the low-end Argon gas or a high-end gas such as Krypton. Gas filling aides in limiting the radiant and conductive heat loss of long-wave room-side heat energy through the windows glass. Glazing – The act or process of securing glass within the sash. Interior snap-in glazing allows for the glass to be replaced easily if broken. It also means the glass cannot be removed from the exterior. Balance System – The mechanisms used to allow smooth and effortless operation of the sash up and down. Block and tackle balance systems can be individualized based on the size and weight of the sash. No matter what the weight of the sash is, it should be able to be operated with one hand. Balance Shoe Lock – Keeps sash in place while allowing sash to operate. Lock removes easily and allows window to be tilted and completely removed from the window frame. This allows for easy sash replacement and maximum egress ability. Pivot Pins – Adhered to sash and secured into a balance shoe provides the means to tilt sash in and hold sash in place while cleaning. Pins must be constructed of titanium strength qualities to prevent breakage and damage to sash. Windjammer – Moveable piece adhered to inside of vertical sash rails that expand into opening when sash is closed creating a unique air barrier. Ventilation Lock – A lock that is utilized to allow a sash to be raised minimally to allow air ventilation as well as stopping the movement of the sash from the outside or inside. Weatherstripping – Flexible material that is applied to moveable rails and frame pieces that assures an airtight fitting of rails in frame pieces. Ideally, a window should be manufactured with replaceable weatherstripping (finseal) in key operational areas. Interlock – The area where the top and bottom or left and right sash join together to perform an airtight closure, and provides a location of adding locking hardware for security. Handles or Lift Rails – Secured onto sash to provide a means to grasp the sash to open and close. Lexan (http://www.answers.com/topic/lexan) material for handles exceed all expectations that window standards require. Grasping area needs to be deep enough to allow for a secure grip. Lock(s) and Keepers – Keeps window sash secure in place while providing security from weather extremes and unwanted intruders. Specialty deadbolt style systems provide locking points in excess of 2. This increases the retention against break-ins. The specially engineered design of a deadbolt system is operated with one handle allowing four locking points to operate together. Screens – Half or full screens allow the ventilation of outside air. Fiberglass with memory retention screen material replaces the original aluminum screens that discolored and rotted easily. Extruded screen rails are far superior to rolled screens. Screen locks add an additional measure of security. Weep Holes – Weep holes are punched into the sill to the exterior side that helps eliminate the build up of water and dirt that can cause damage to window and wall materials. Rollers/Wheels – Used in windows configured as sliders. For effortless operation there should be multiple sets per each sash. Cranks/Operators – These are used in casement and awning style windows. Nonrusting and a full 90 degree opening feature is the best hardware for functionality and lasting operation. Grids – Combination of vertical and horizontal bars that cross to provide the appearance of small glass panes. Also referred to as a muntin bar or grille. Internal grids permit easy cleaning of glass. Grids can have rectangular, diamond or circular patterns. Art Glass/Beveled or Etched Glass Patterns – The addition of internal decorative options provides a personal look to your windows. Warm Vinyl Colors – Quality vinyl windows come in white, beige, brown and have the ability to have woodgrain as the interior on each of those colors.